With little more than the paneling, a scrap of 2″x 10″ pine in my garage, a circle saw and a hand full of deck screws I was able to fashion 5 target stands for under $10.00 (most of which was the cost of the screws). Using a speed square, circle saw, and a field expedient work surface, cut the paneling (can substitute plywood) into 9″ x 24″ strips and the pine board into 2 5/8″ blocks. I sanded all cuts with a ‘sanding sponge’ to make the stands easier on the hands when assembled. Pre-assemble with glue and clamp into a shallow box. The long slot in the middle should be just under 19″ wide. Pre-drill holes for screws (prevents splitting) at 1″ in and 1″ up from bottom edge and 1″ in and 1 1/2″ from top. Flip the box and do the same again. Use 2″ deck screws to secure. Shallow boxes. Long slot allows for different widths of target. For the feet of the stand, cut paneling into 7 1/2″ x 24″ planks. Find the center and mark perpendicular line with speed square. Mark screw positions at 2.5″, 4.5″ and 6.5″ from bottom edge. (At this point I chose to cut the upper corners of the feet at 45 degree angles for cosmetics and to save possibly scraped ankles.) Find centers of small edge of the assembled shallow boxes and mark at same distances. Pre-drill for screws. Apply glue and attach feet with deck screws. How do they work? Pretty darn good; with a base of 24″ square and made of solid wood they are very stable. I set up a homemade cardboard target, cut from a furniture box, stapled to 1″x 2″ furring strips. There was a little play front-to-back due to the depth of the slot (using 2″ thick boards as spacers) . To solve this I used cutting scraps of paneling as wedges. Next time I’ll try stapling the target to the 1″ side of the furring strips instead of the 2″ side. 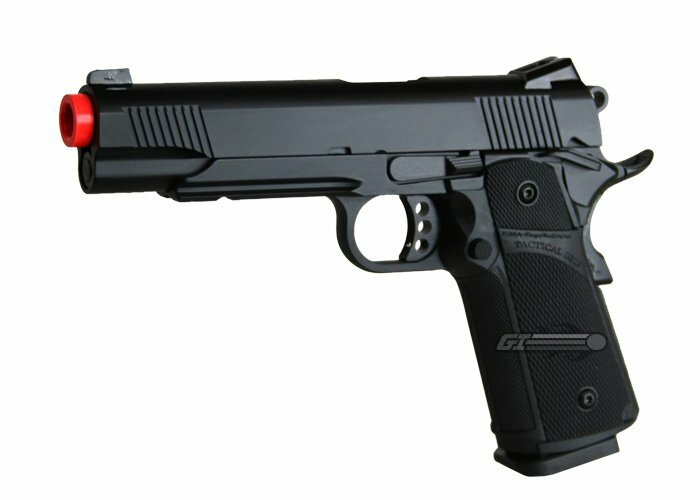 Not wanting to wait to get to the range to test the stands I loaded up my Airsoft 1911 (KJ Works GBB-614) and thoroughly enjoyed the fruits of my labor. Front sight, press, smile, repeat. Update: They also stack for storage. American Handgunner Magazine, Digital Ed.